Tras el nombre THE HEARD nos encontramos una banda nueva que llega de Suecia, pero con unos integrantes conocidos por la mayoría. 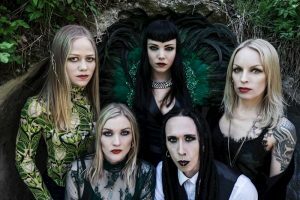 Este grupo está compuesto por tres de las excomponentes de CRUCIFIED BARBARA; el bajista de DEATHSTARS y la artista de Burlesque Pepper Potemkin, la cual es la primera vez que canta en una formación más o menos profesional, y sorprende por su calidad vocal. Acaban de lanzar su álbum debut, que se titula “The Island”, y hoy indagamos en cómo se juntaron estos artistas para dar a luz a esta nueva criatura, de su debut y de la importancia de cuestionar en la escena el status quo con Pepper, la frontwoman de la banda. Tras el nombre THE HEARD nos encontramos una banda nueva que llega de Suecia, pero con unos integrantes conocidos por la mayoría. 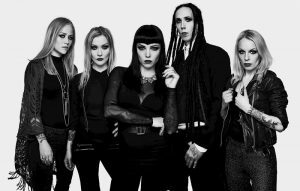 Este grupo está compuesto por tres de las excomponentes de CRUCIFIED BARBARA; la guitarrista Klara “Force” Rönnqvist Fors, la bajista Ida “Evileye” Stenbacka y la batería Nikki Wicked, Skinny Kangur, bajista de DEATHSTARS que aquí se pasa a las seis cuerdas y la artista de Burlesque Pepper Potemkin, la cual es la primera vez que canta en una formación más o menos profesional, y sorprende por su calidad vocal. 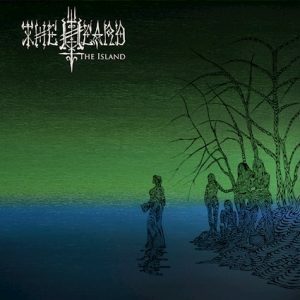 Acaban de lanzar su álbum debut, que se titula “The Island”. Y si os preguntáis cómo puede sonar, son como unos primerizos GHOST en una versión más pesada. Más Doom. – Hello and first, of all, thank you for ansewring to our questions. How has everything been lately into the THE HEARD’s camp? How does it feel having released your debut album? I guess these might be exciting times for the band. We have just got back from Tokyo, Japan where we played one acoustic set at the Swedish Embassy and a full set at a sold out venue called Space Odd during Export Music Sweden and Creativeman Productions night called Hokuo Loud Night. So we are s8ll stoked from that experience. We are happy to receive lots of positive responds from our fans around the world about our debut album. – All of you are well-known into the music scene but THE HEARD is a new band, so I imagine this allows you to do whatever you want, not trying to fit into anything previously done. How has it felt to work on a “new baby” so to speak? Have you given yourselves absolute freedom in that sense? I suppose a debut album might be like some sort of experiment, trying sounds, starting to shape your own iden8ty… Have you already found things you’d like to do differently on a second album? Our main thing was to do what we wanted and to do it our way not to have to be expected to sound like anything we have done before. The Heard is a ”new baby” and for me my ”first baby” and it’s hard even for us to say what kind of music we play but we like it that way, we are all over the place! 🙂 What I like to do for the next album is to have more time in a longer period and not so many spread out short sessions. – In fact, how did most part of the CRUCIFIED BARBARA exmembers, DEATHSTARS’ bass player (Skinny) and Pepper gather to form a new act? We have know each other for years through rock clubs, common friends, bars, concerts and so on. Klara, Nicki and Ida knew that they wanted to continue to play together and Klara ran into Skinny at a record fair and popped the question and he said yes. I bumped into Ida at a subway station and we just talked about what we where up too and she asked if I was interested in hearing some songs that they had recorded in the rehearsal space. I ran home and listened to the songs and I liked the sound so the rest is… the future, haha! – Anyway you are a statement on your own, since this is not any of your former work, but something completely new. Anyway, what lessons have you learned with your previous bands and works that you are now applying to your work with THE HEARD? Since I come from the burlesque scene I had added more of my theatrical side, not that I don’t have any experience from being part of a band but my stage experience is more from a burlesque performers view. I am not afraid to take som extra steps and really integrate with my audience and The Heard gives me that space. It’s a kick for me to be able to reach out to the people and make them feel good and to feel apart of the show. – Your debut album is “The Island”. Would you mind to elaborate a little bit on its concept? Its about a place, The Island , where reality and mystery meet. We serve you short stories filled with both love and sorrow about this haunted place that will give you the creeps but still you can’t look the other way you need to know more and you want to know what happens to the young girls during night and who was it that cut the line that rainy night many years ago? We want our listeners to really sit down, invite The Island and escape from reality while listening to the songs and experience the whole story. 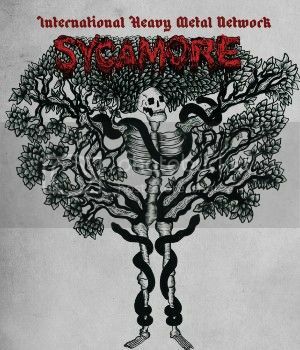 – In fact the album has some subtle Folk nuances which perfectly fit the story, as well as the overall dark atmosphere. What did it come first, the concept or the sound? Did you have the whole picture in your mind before starting to create the record? The sound came first and during the process of writing lyrics and telling stories about an actually island that two members of the band have a connection to it all made sense, so we added some creatures and figures (or did we, really?) to the stories and really visualized what could happen at this place and we decided that they had do live on an island too and the concept took shape. It was amazing to write about The Island. I work best when I really can feel, taste and be what I’m / we are writing about. – The atmosphere is quite powerful but the overall approach of the album is really simplistic, or straight-forward. How easy is to find a good equilibrium between these both elements that can sometimes work as opposites? I think that since we all felt an hunger to really do what we wanted to do no matter what musical background or band we have played with before we where open for many ideas and suggestions that we sometimes put aside for a while and really let the songs grow and think about how we felt while playing them and how you as a listener would feel. Many turns passed and lots of different versions where made but the result is epic! We have so many different inspirational aspects among us but I can of course mention Black Sabbath. But some of us is really into Jazz music so we share a really wide spectra. My personal favorite is weird and spooky stuff along side with mys8cal fairytales, religion, legends, history and so on. One of our favorite writers is called Johan Ajvide Lindquist. His books are just amazing, perhaps you’ve heard about his book/film ”Let the right one in”? – Your first single is “Tower of Silence”. Why did you choose this song? And what could you tell us about its video? First of all we wanted to chose a faster and harder song then the previously released ones, White Lightning and Sirens. The choice was simple and felt right. Since we are fans of old horror b movies we wanted it to have the feel of that but in a modern touch. Damòn Zurawski and Johan Baath who have filmed the video are old friends of ours and they understood our vision directly. – All this about “The Island” being said; how could you describe it in just 3 words? – I would specially like to talk about one of the songs on the album, which is “Revenge Song”. What’s the idea behind it? I read it was inspired by the #MeToo movement. You have done your homework 😉 When the #MeToo movement started and all those horrible stories spread like fire we got filled with rage and disgust. We felt that we needed to write a song that gave strength to us and the listeners. – Almost at the same time we knew about the #MetalToo movement and about Kill the King, in your own home country. Would you say the demands of the movement are met in the music/Metal world, from what you can tell from your experience? It seems like things are finally changing. Things are finally changing but theres still a very long way to go. But I’m glad that it’s going the right direction. Since I come mostly from the Burlesque scene where women have the leading role I have little experience of assholes. Maybe ”just” some stupid comments but nothing I couldn’t handle by my own. I know it exists in the business but I have been lucky so far. – There has also been some polemics surrounding this by those who think “politics” shouldn’t be mixed with music, but “the personal is political”. What are your thoughts on this? I think taking a stand is always necessary, so is taking actions and forming new movements and colectives that question the status quo. I don’t think that its wrong to mix the two. But #MeToo is more than politics it’s the biggest NO for everyone on this planet who has been effected. It’s about the lack of respect and we need to change our attitude right now towards one and other. This has to be learned in school and talked about all the time. – And before wrapping this interview up, what’s now in store for THE HEARD? I see you have a gig with Jonathan Hultén late this month. – That’s all, thank you once more for answering our questions. If you want to add some final words; feel free to do it.